Today's busy physicians office needs Doran DS5100 Digital Physicians Scale that provides a faster and easier way to weigh and measure patients accurately. With Dorans Touchless Start feature, you can acquire a patients weight in as little as two seconds without any buttons to press. Today's busy physicians office needs Dorans DS5100 Digital Physicians Scale that provides a faster and easier way to weigh and measure patients accurately. With Dorans Touchless Start feature, you can acquire a patients weight in as little as two seconds without any buttons to press. Simply have the patient step onto the large DS5100 platform and an accurate weight up to 500 pounds will be held on the display. Once the patient leaves the platform, the DS5100 is immediately ready for another weighment. Imagine the time saved over a year in weighing patients alone! If you are still using yesterday mechanical scale, its time to consider what technology can do to improve your workflow. No longer will you have to guess a patients weight while waiting for the beam to settle for your elderly and unstable patients. Our exclusive Weight Lock feature allows an accurate weight to be held regardless of a patients motion. The days of small, unstable, four-inch tall mechanical scale platforms are a thing of the past. 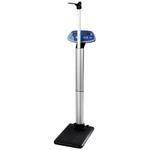 The DS5100 Digital Physician Scale works on any flooring, including carpeting. The sturdy aluminum column houses the height measurement rod. Simply extend the measurement arm and pull upwards for adult heights or push down to measure a childs height. To calculate BMI, enter the height using the scroll buttons, press the BMI button and the patients Body Mass Index is instantly displayed in the right LCD. When not in use, the BMI display functions as a clock in 24 or 12 hour format.